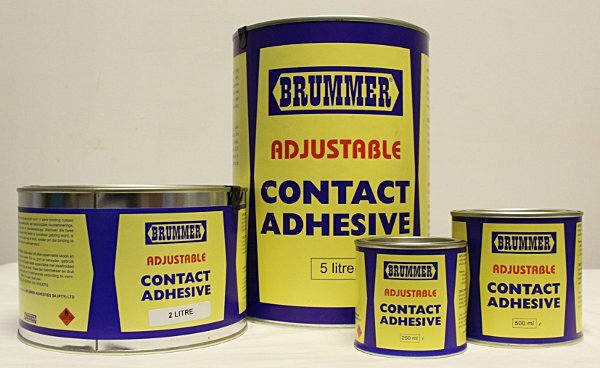 BRUMMER ADJUSTABLE CONTACT 67 is an all purpose solvent-based adhesive. The bonds are highly age resistant and remain flexible even in the cold. In the absence of a particular stress they initially resist temperatures of 65-70°C increasing to about 85°C after some time. A feature of the product is that, once the glued surfaces are brought together one still has time to align or adjust the contact area without weakening the final bond. Hence the reference to “adjustable adhesive”. By brush or notched spatula. Product needs to be applied to both surfaces and allowed an open time for 20 – 30 min. Press both surfaces together and apply pressure. This product is widely used for most wood adhesion applications. E.g. Melamine, Formica, Chipboard, Cork Panelling and gluing of rubber and metals onto wood. BRUMMER ADJUSTABLE CONTACT 67 is flammable and contains solvents which evaporate rapidly hence the receptacles used are to be closed after each removal of material. BRUMMER ADJUSTABLE CONTACT 67 can be diluted with Brummer Neoprene Solvent.